Share these special holiday moments with an extra-special eggnog recipe. 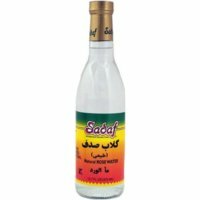 This Eggnog with Saffron and Rosewater tastes just like decadent Persian ice cream!Sponsored by Davidsons Safest Choice Eggs™. The holiday season is upon us and every moment is extra special. I always try to take a step back from the mayhem to relish in the happy noise and chaos that fills my house. The Professor is in 8th grade, with high school looming in the future. I hold this growing giant tightly and recall Christmas memories. Like when he was barely 2 years old and he burst into tears of terror thinking some big fat man in a red suit was going to be in his house while he slept. He now winks and smiles at me when there is talk about Santa around the younger siblings. I just want to hold on to the magic a little longer. Our Christmas tree is filled with these magical memories. There are ornaments made during preschool days through today. Lots of tiny treasures with their young faces or handprints blazed across the front. I used to have visions of a magazine cover Christmas tree where everything matched. But after collecting these lovelies for the past 13 years, I love my bohemian collection of mismatched madness. During the holidays, around the world we collectively cherish our loved ones, help those in need and pass on traditions and customs to the next generation. I am not a Christian, but I adore the spirit of the holidays this time of year. 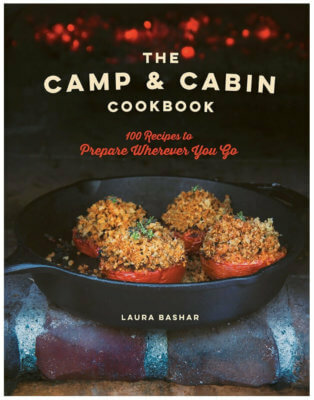 Weaving Persian culture and flavor into Western traditions is one of my passions. I want to show my children to not only remember where their family came from, but to also love and respect where they are now. In a way, this eggnog recipe is a prime example of what I believe in. Eggnog is a traditionally Western concoction, believed to have originated in England. 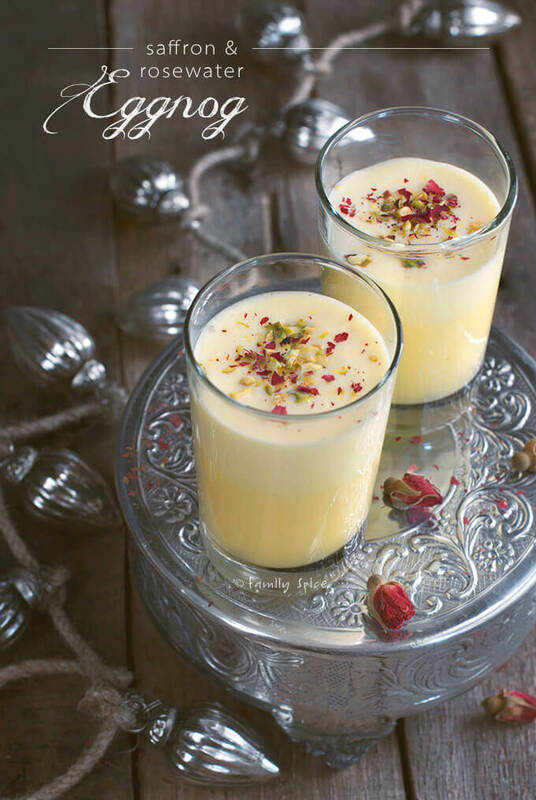 I added a bit of Persian twist with my eggnog. Well, my inspiration came from my husband who suggested this! 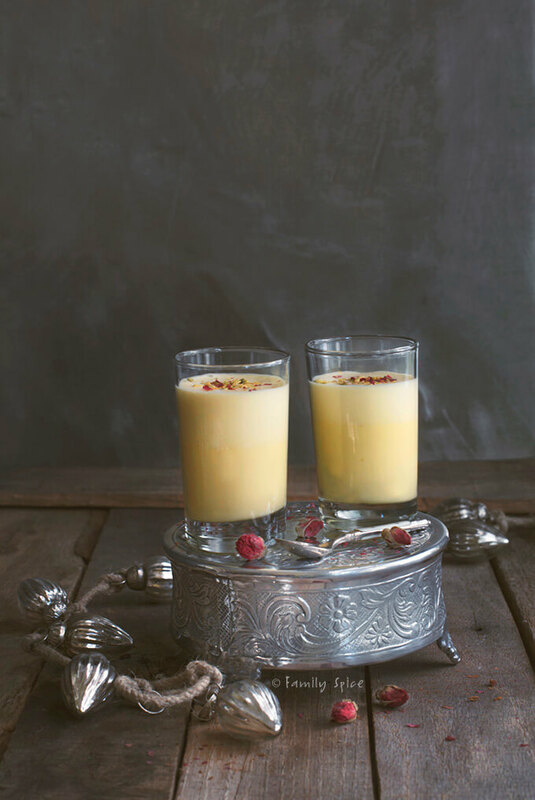 This Eggnog with Saffron and Rosewater tastes just like melted Persian ice cream. Two cultures merged into one. It’s a beautiful thing. For the past two years I have been a brand ambassador for Davidson’s Safest Choice Eggs. I am thrilled to be working for such a wonderful company and promoting an equally wonderful product. With pasteurized eggs, you do not have to worry about salmonella poisoning, and you can enjoy homemade egg nog safely. Last year I made Chocolate Egg Nog, and this year I am sharing Eggnog with Saffron and Rosewater. In a small bowl, combine saffron and hot water and let steep 10 minutes until use. Using an electric mixer or stand mixer, beat egg yolks and sugar until pale yellow and thick. Stir in heavy cream, milk, brandy and rose water with the egg yolk mixture. Add saffron water to the cream mixture. In a separate bowl, whisk egg whites until soft peaks form. Stir egg whites into the cream mixture. Chill egg nog until ready to serve. 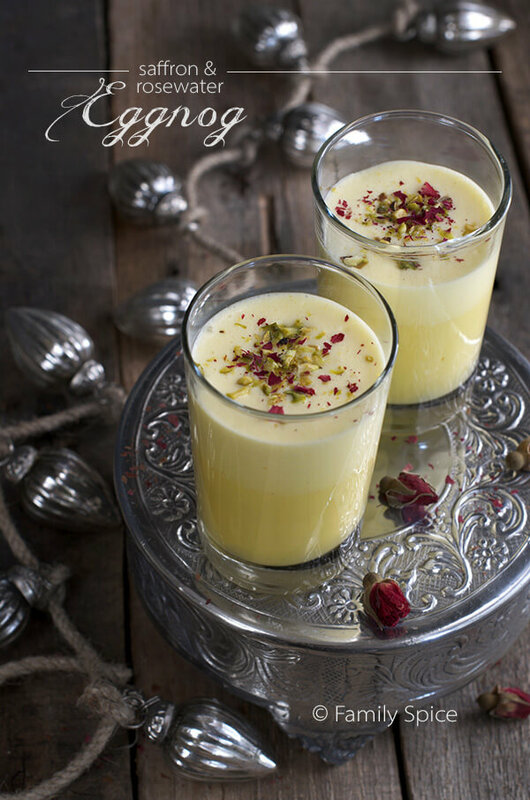 Garnish glasses of egg nog with chopped pistachios and crushed rose petals. Disclosure: As I am part of the Darling Dozen, I did receive a stipend from Davidson’s Safest Choice Eggs™ to develop an egg nog recipe using their product. The story I have written is all true, and the opinions are truly mine. If I didn’t like it, I wouldn’t blog about it. Wishing you all a beautiful holiday season – love your spirit and sentiment. Oooh, melted Persian ice cream does sound interesting. I think it’s great you’re keeping the cultures alive. This eggnog looks so good! 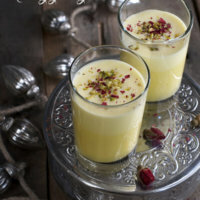 Saffron and rosewater in eggnog? Wow! Dynamite idea — love it. Thanks. 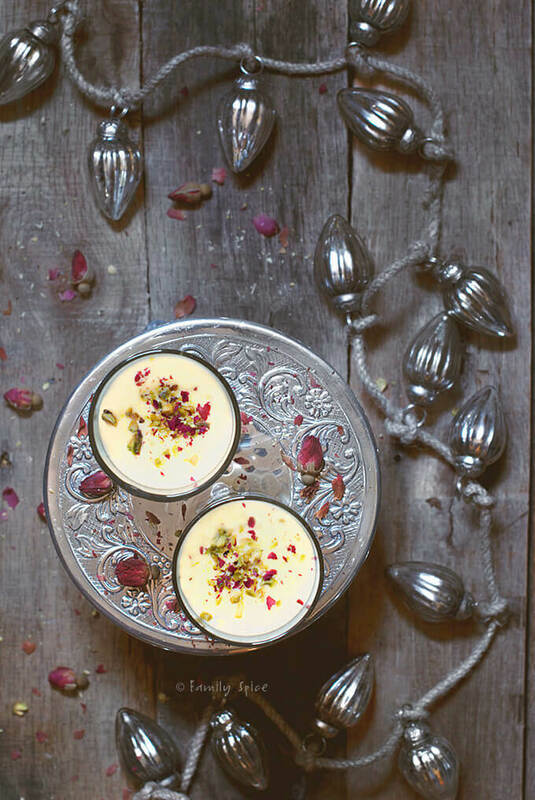 I’m very intrigued by this recipe as I never would’ve dreamt up saffron and rosewater together with eggnog. 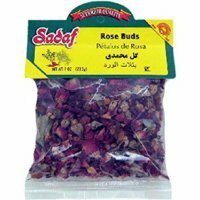 If I get my hand on some rosewater, I may try this. Love this time of year because of the eggnog. 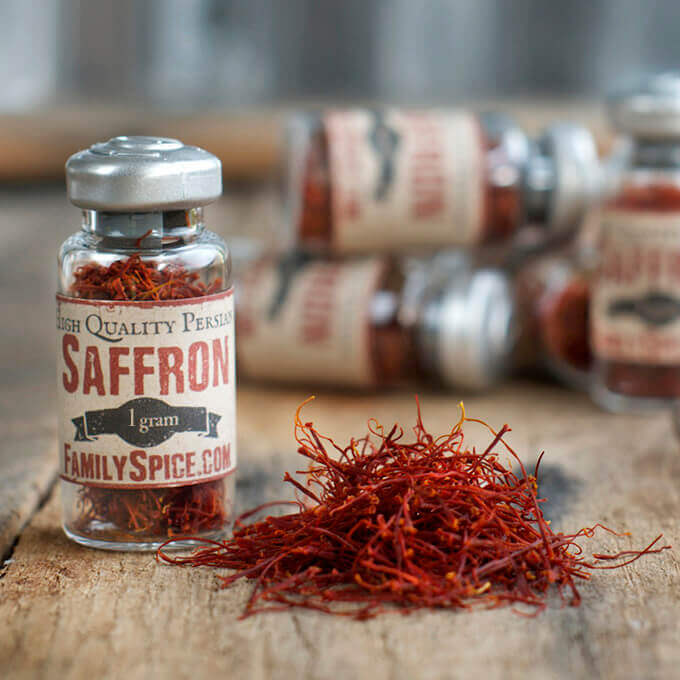 I just picked up a bottle of Saffron today when I was out shopping! I must make this! I love all of the variations on a classic! Honestly, so so beautiful. I love the tone and colors, it feels super warming and lovely. Ooooh I love this twist on traditional eggnog!! I also love your photography set up; the string of ornaments makes it so cute and festive!